It’s quite handy that stores start selling Easter goodies well in advance – it means I was able to buy some polystyrene eggs and decorate them to use for my son’s Nintendo themed birthday party! My Sunday Inspiration post really gave me lots of ideas that I made my own, and the Yoshi eggs was one of them. They were super easy to make, and so effective for a Nintendo party! You need a bunch of polystyrene eggs – I bought mine from Poundland, but I’m pretty sure at this time of year you’d find them in craft shops too. 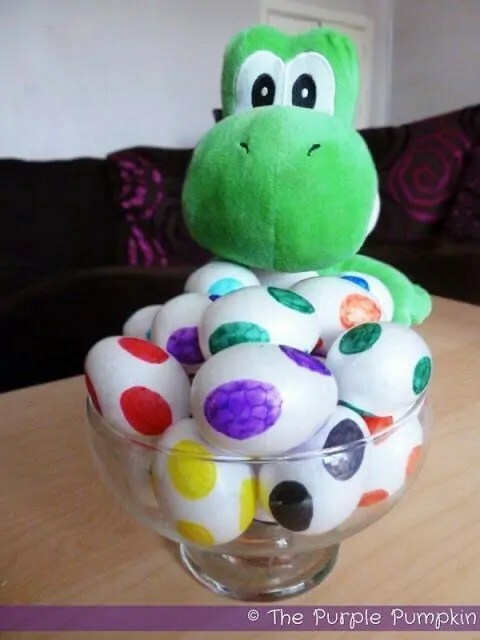 Even if you don’t do a mix of colours, make sure you at the very least make green Yoshi eggs! With everything ready to go, it’s time to get colouring! I don’t have any progress photos I’m afraid, but it’s as simple as drawing large dots, evenly spaced around each egg – one colour per egg. I did one side, let it dry for a few seconds before moving around. The ink does take a few moments to dry off – if you don’t do this, you’ll end up with coloured ink all over your fingers. Once you have coloured in your desired amount – I made 24 eggs – display them any way you see fit. I popped all mine in a bowl. I was originally going to put them in a basket, but the basket was way too big. I have a Yoshi plush, so he guarded the eggs! I thought that they came out great! One of my favourite decorations for this party I think!